Home » Retirement Planning » What Is A 403(b)? A 403(b) is a tax-sheltered annuity account allowed under IRS rules to gain certain tax benefits over savings accounts or other non-regulated savings. It is very similar to a 401(k), and uses pre-tax contributions, except that it is designed to be offered by nonprofit 501(c)(3) organizations, public school organizations, Indian Tribal Governments, or churches rather than for-profit companies such as the 401(k). Organizations that offer 403(b) plans are usually schools, public organizations, religious groups, or hospitals. In the past, they often offered contributors fewer investment options, but plan options have generally become more robust over the last few years. While immediate vesting is not required, and it varies by offering organization, 403(b) plans tend to have shorter vesting times than 401(k) plans overall. Both employers and employees may contribute to 403(b) plans. If you’re familiar with 401(k) plans, you likely already know the high points of a 403(b) plan. However, if you’re not, there are some important 403(b) facts to know about if you are considering investing in one. Contribution Limits For 403(b) plans, the combined contributions of employee and employer must not exceed the smaller amount of either $55,000 (for 2018) or the total of the employee’s includible compensation for the most recent year of employment. Elective Deferrals Like the 401(k), 403(b) plans allow your employer to not include your elective contributions to your plan in your gross income under the elective deferrals rule. For the 403(b) the limit is $18,500 in 2018. 15-Year Rule Even though administrative costs to your employer may be lower, costs to the employee for making investments or other maintenance duties are notorious for being higher than fees charged to participants in 401(k) programs. Again, this varies greatly by the administrator your employer chooses. Be sure to review all fees before deciding to participate. Over 50 Catch Up Once employees are over the age of 50, they can make a catch up contribution of $6,000 (as of 2018) to help bulk up their 403(b) account before retirement. This amount is reduced if catch up contributions are made to any other retirement accounts. In addition to eligibility requirements, 401(k) and 403(b) plans are very similar, but there are some notable differences beyond how nonprofit and profit companies or organizations tend to manage them. Early Withdrawals: The biggest difference between 401(k) and 403(b) plans is that if you retire at 55 or older you can go ahead and start taking distributions from your 403(b) plan without a tax penalty rather than waiting until you turn 59 ½. Administrative Costs: While costs vary by the administrator your employer chooses and the options for investing that are offered, 403(b) plans generally have lower administrative costs. This hopefully means more employer contributions into employee accounts. Investment or Maintenance Costs: Even though administrative costs to your employer may be lower, costs to the employee for making investments or other maintenance duties are notorious for being higher than fees charged to participants in 401(k) programs. Again, this varies greatly by the administrator your employer chooses. Be sure to review all fees before deciding to participate. Limited Investment Options: While the number of investment options has improved in past years, it rarely matches the freedom of a 401(k) for the number of choices. A bigger concern, however, is that many 403(b) plans restrict how often participants can make changes to their investments. What Happens To My 403(b) If I Go To Work For Someone Else? Changing jobs is just a fact of life in our modern economy. However, like most retirement plans, you’re not going to lose your retirement when you move. It’s important to remember that while your money is yours, any employer contributions will only be yours once you are vested in the plan. While exact options for what to do with your old 403(b) plan will vary depending on the retirement plans offered by your new employer, there are some standard ways to take your money with you to a new job. 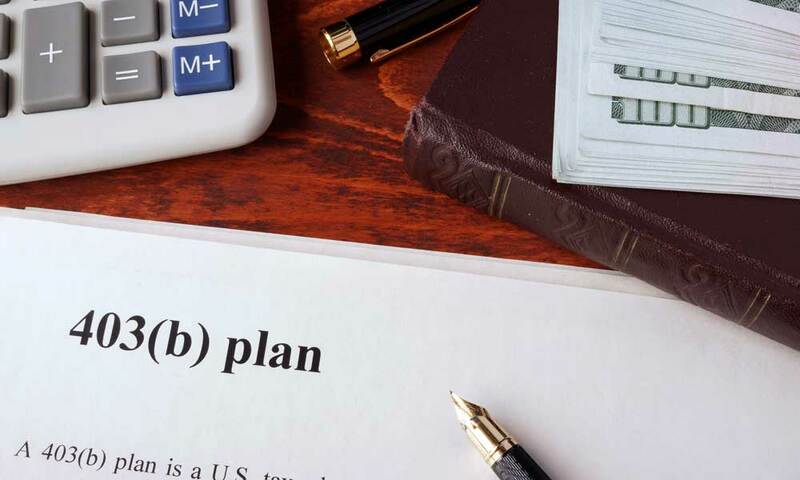 Roll Over Plan to Plan: While 403(b) plans cannot be rolled over except in certain circumstances, a job change is one of the allowed circumstances. As long as you do not lose money in the process (such as from non-vested employer contributions) and both your previous employer and new employer plans allow plan-to-plan transfers, you can roll your old 403(b) directly into your new 403(b). Let it Ride: Even though not all employers offer the option, many will allow former employees to leave their 403(b) as it is with the current administrator. Cash it Out: While it’s not recommended due to significant tax implications, some choose to cash out their 403(b) when changing jobs. Sometimes the balance is low and they feel it is not worth the hassle or fees to move the funds and sometimes people cash out plans to pay immediate expenses while changing jobs. If a 403(b) plan is cashed out early, before age 59 ½, you will pay taxes on the amount like any other income plus a 10% tax penalty. Rollover to New Plan Type: If your new employer does not have a plan you can rollover your 403(b) into via the plan-to-plan option, you have other options. You can rollover your 403(b) into a Roth IRA, a traditional IRA, or a non-Roth eligible retirement plan. It is important to note that some rollovers will not permit all contributions to transfer and there are time limits, usually 60 days, on how long the funds can be between plans before tax penalties occur. It’s best to consult a trusted financial adviser who is knowledgeable in 403(b) plans before attempting any rollover. When Can I Withdraw From My 403(b)? Distributions from a 403(b) generally become possible at age 59 ½. However, it does have a special rule for those who retired at over age 55 to begin distributions early. Also, there are other situations in which early distributions can be taken without tax penalties. Most early distributions follow the same rules as the 401(k) plans and other retirement accounts. However, there are special allowances for 403(b) investors in certain cases. Retired public safety officers can take up to $3,000 to pay for insurance premiums for accident, health, or long-term care plans. Qualified active reservists or national guardsmen and women called to duty for 179 days or an indefinite period of time may also be able to take early distributions without penalty. Again, it’s best to consult with a tax professional experienced in early withdrawals to ensure conditions are met and proper paperwork is filed. There are benefits and downsides to a 403(b) when compared with its closest relative, the 401(k) account. However, the downsides are rarely enough to prevent someone from using a 403(b) as an investment vehicle when it’s the type of retirement account offered by their employer. The additional benefit of being able to take early withdrawals if you retire at 55 years old or older is also a very strong incentive to use a 403(b) for retirement planning as it could be funds you depend on until Social Security benefits age is reached. What is a 401(k) Retirement Plan? What Is A Roth IRA? What Is An IRA?